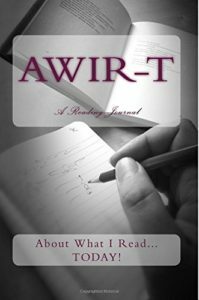 AWIR–T™ is a journal designed to record your feelings and thoughts about what you read each day. It’s a book for you and by YOU because you decide whether to make entries throughout the day (as you are appreciating new reading material or a familiar passage in a changed light) or at the end of your day. 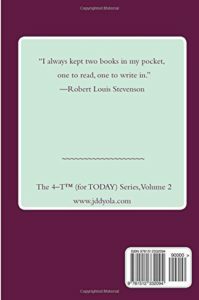 This is the 2nd volume in the 4-T™ “for TODAY” Journal Series…Books for you and by YOU! More about JD Dyola’s reading journal—AWIR-T: About What I Read…TODAY! About a year or so ago, in addition to my general journal, I began to use a separate notebook for what I had learned during the day, another for notes about material that I had read that day, and a third one as a daily gratitude journal. At the beginning of my journal entry I would write “What I Learned Today,” or “About What I Read Today,” or “What I’m Grateful for Today.” In a short time, I was writing only the acronym for each journal heading (WILT, AWIRT, and WIG4T). The 4-T journals emerged! Then at the beginning of 2015, I started researching what’s involved in becoming indie author (self-published, independent author). I got a lot of helpful advice from other indie authors and soon the 4–T™ Journal Series was born! Then, after a few weeks of carrying around 3-4 journals every day along with other books, I developed WAW 4-T: The Combo Journal. I figured that if I found journals like this valuable then others might also. And I believe that I was right because you’re here reading this. I hope that you’ll love the 4-T™ journals as much as I do and enjoy using them! *This is a review of the original journal when it debuted in 2015.